To provide patient-centered care, a partnership that considers treatment options based on a patient’s individual concerns, preferences, and values. We will achieve this with up-to-date, high quality dental care in a relaxing and enjoyable atmosphere. Orthodontic braces are fixed appliances applied to your teeth to align your bite and straighten crooked teeth. Braces can dramatically improve the appearance of your smile, but they also improve the function of your teeth and jaw. 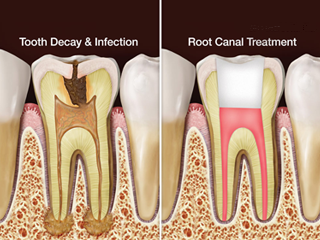 When the pulp (the soft tissue inside the tooth that contains blood vessels and nerves), becomes diseased or injured and unable to repair itself, a Root Canal is needed. The most common causes of the pulp dying is a deep cavity, traumatic injury to the tooth, or a cracked tooth. Patient-centered care involves transforming our relationship with patients where traditional a care provider’s treatment is the same for most patients, into a patient-provider partnership that considers treatment options based on a patient’s unique concerns, preferences, and values. There’s nothing more precious than a child’s smile! From their very first visit, we want kids to be comfortable and have a fun experience. With good brushing & dietary habits at home, plus regular dental checkups, children can reach adulthood without ever suffering with toothaches or cavities. When the pulp (the soft tissue inside the tooth that contains blood vessels and nerves), becomes diseased or injured and unable to repair itself, a Root Canal is needed. Orthodontic braces are fixed appliances applied to your teeth to align your bite, straighten crooked teeth, and can dramatically improve the appearance of your smile. There is nothing more precious than a child’s smile. From their very first visit to our office, we want children to be comfortable and have a great experience. First City Dental of Abbotsford, S.C.